India.Arie, born India Arie Simpson on October 3, 1975, in Denver, Colorado. She absorbed musical skill early in life, encouraged by both parents: her mother, Joyce, herself a former singer, and now India Arie's stylist; and her father, former ABA and NBA basketball player Ralph Simpson (not former NBA star player Ralph Sampson, as has been mistakenly reported in some media). She had taken up a succession of musical instruments throughout her schooling in Denver, Colorado, but her interest in the guitar while attending the Savannah College of Art and Design led to a personal revelation about songwriting and performing. "When I started tapping into my own sensitivity, I started to understand people better. It was a direct result of writing songs," she said at the press release of her debut album, Acoustic Soul. Co-founding the Atlanta-based independent music collective GroovmentEarthseed (Groovement was the collective artists' name and Earthshare was their independent label name), her one-song turn on a locally released compilation led to a second-stage gig at the Lilith Fair. Their Universal Records/Motown music scout spotted her and made an introduction to Motown CEO Kedar Massenburg. Sidestepping all the devices of flavor-of-the-month record-making, Acoustic Soul acquainted listeners with a brave and eloquent new voice, drawing an uncommonly broad swath of listeners from hip-hop, the so called neo-soul, blues, folk, and classic troubadour-style singer/songwriting, all at once. The album, released in 2001, debuted at number ten on the U.S. Billboard 200 albums chart and number three on the R&B album chart. Within months, without the concentrated radio play that typically powers pop and rap albums, Acoustic Soul was certified double-platinum. India.Arie also features on Stevie Wonder's album A Time To Love which was released on October 18, 2005. India.Arie and Stevie Wonder duet on the title track "A Time To Love" that India wrote, which was nominated in the 2006 forty-eighth Grammy Awards, for Best Pop Vocal Collaboration with Vocals. On the September 2005 premiere of The Tyra Banks Show, Arie performed "Just 4 2day". She wrote this song especially for Tyra's show. Arie also wrote "What About the Child", a song that did not air but was made available as a $1 internet download to support child victims of Hurricanes Katrina and Rita. 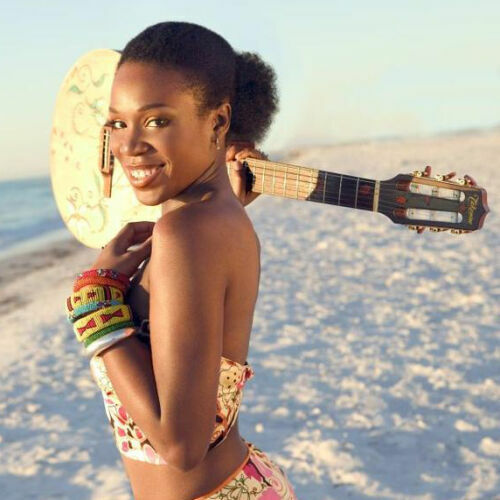 Voyage to India India.Arie followed the success of her debut in 2002 with the release of Voyage to India. Debuting at number six on the Billboard 200 and number one on the R&B chart, the album eventually earned a 2003 Grammy for Best R&B Album. The single "Little Things" also won a 2003 Grammy for Best Urban/Alternative Performance. Soon after its release, Voyage to India was certified gold; and it was certified platinum on Friday 4 August 2006. Testimony: Vol. 1, Life & Relationship India.Arie's third studio album, Testimony: Vol. 1, Life & Relationship, was released on June 27, 2006. Testimony: Vol. 1, Life & Relationship gave India.Arie her first number-one on the Billboard 200 and was her second chart-topper on the U.S. R&B album chart. This album was also the first #1 album for the Motown record label in 33 years since Diana Ross's #1 Lady Sings the Blues Its first week sales of 161,000 copies is Arie's best sales week to date and was certified gold on Friday, August 4, 2006. Testimony: Vol. 2, Love & Politics was released on Tuesday, February 10, 2009.